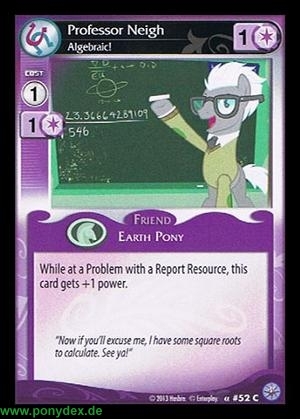 Deutscher Name: Professor Neigh, Algebraic! Englischer Name: Professor Neigh, Algebraic! While at a Problem with a Resource Report, this card gets +1 power. "Now if you'll excuse me, I have some square roots to calculate. See ya!"